Robert Feagan working on home build in El Salvador with Laurier students. Waterloo – Associate Professor Robert Feagan, a faculty member in the Social and Environmental Justice and Social Justice and Community Engagement programs at Wilfrid Laurier University’s Brantford campus, and Associate Professor Sofy Carayannopoulos, a faculty member in the policy area at the Lazaridis School of Business and Economics at Laurier’s Waterloo campus, have won Laurier’s Faculty Award for Service Excellence and Community Engagement for 2018. The award recognizes full-time faculty and librarians who, in addition to their teaching and scholarship, are leaders in service to the community and/or university. As one of the earliest hires at Laurier’s Brantford campus, Feagan has devoted considerable time and energy to community and university service since 2001. Among other activities, he is an active member of the Save the Evidence campaign of the former Mohawk Institute residential school. He also recently took part in the construction of an “Earthship,” a radically sustainable home on Six Nations territory and participated with a committee supporting a Syrian refugee family sponsored by Laurier Brantford. On national and international levels, Feagan has worked in partnership with Habitat For Humanity to build figurative bridges with and actual homes in El Salvador and the Elizabeth Métis Settlement in northeastern Alberta over the last seven years. 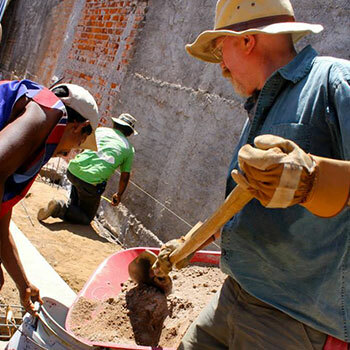 In connection with this, he has created and led a field course that takes Laurier students to El Salvador to learn about shelter and social justice as they help build homes in communities there. Feagan has also been actively involved with a variety of community organizations, including the Grand River Conservation Authority, Brantford Community Foundation Environmental Committee, the City of Brantford’s brownfields subcommittee, Brantford Farmers’ Market, Hazelwood Community Garden, Eagle Place Community Association and various tree planting roles with local high schools and the Brant Tree Coalition. At Laurier, Feagan has served as coordinator of the Contemporary Studies program (now Social and Environmental Justice), a member of the Community Engaged Scholarship committee, and co-chair of a 2004 international conference on community theory and practice. The latter contributed to his primary focus at the Brantford campus, which is on developing community service learning opportunities for his students. Carayannopoulos has focused much of her service work on helping Laurier students succeed, particularly at the Lazaridis School of Business and Economics. As a residence learning community faculty advisor, she works with dons to help students understand and meet business program expectations and ease transition. Carayannopoulos also assists with recruiting prospective football players who are interested in Laurier’s business program and has helped bring several players to Laurier. Business competitions are a big part of life for many Lazaridis School students and Carayannopoulos assists with several. She organizes the annual BU111 Live Case Competition at Laurier and is currently organizing a new technology-focused international case competition, the Lazaridis International Case Conference, which will bring 12 universities from around the world to Laurier in October. Carayannopoulos has won numerous awards both personally and as a leader of student teams. She has won an Ontario Undergraduate Students’ Association Teaching Award and a Residence Academic Partnership Award. Thanks to her leadership and co-coaching, Laurier recently won top place at the University of Navarra International Case Competition (Spain) and placed second at the McGill Management International Case Competition. Carayannopoulos also twice helped Laurier teams win the Jeux du Commerce Central (JDCC) School of the Year Award. In recent years, Carayannopoulos has served as an organizer of JDCC Tech Talks and faculty co-advisor to Laurier’s Inter-Collegiate Business Competition (ICBC) team. She currently serves as an informal resource to the Lazaridis School’s The Link student club. The Awards for Service Excellence and Community Engagement will be presented during the spring 2018 convocation ceremonies. Feagan will be recognized on June 6 and Carayannopoulos on June 15. A complete list of honorary degree recipients and award winners will be posted to Laurier’s Convocation web pages before June.